← How Are Sturgeon Weathering the Drought? Question: I will soon be taking off to the mountains to do some mountain quail and tree squirrel hunting. In past years, after arriving at hunting camp, most of my hunting was done on foot and so I couldn’t cover much ground in a day. Last year I took my grandson with me to start teaching him a little about gun safety, hunting and camping in the wild. After walking for a while he got tired and wanted to rest. We were walking along a logging road and he told me he wished he had his bicycle with him. This got me to thinking that with a bike I could cover a lot more area, be basically silent, use no fossil fuel and get some much needed exercise to boot. So, for my hunting trip this year I purchased a mountain bicycle and got it geared up with saddle bags and a handle bar gun rack for my shotgun. Now I’m all ready to go but can’t find any hunting laws, rules or regulations concerning guns and bicycles on logging roads. Here are my questions: Can I legally shoot from my bicycle while stopped with my feet on the ground or do I have to completely dismount the bicycle to shoot? Can I have a shotgun shell in the chamber while on my bicycle (like while walking) or must I have the chamber empty and action open like when in a motor vehicle? 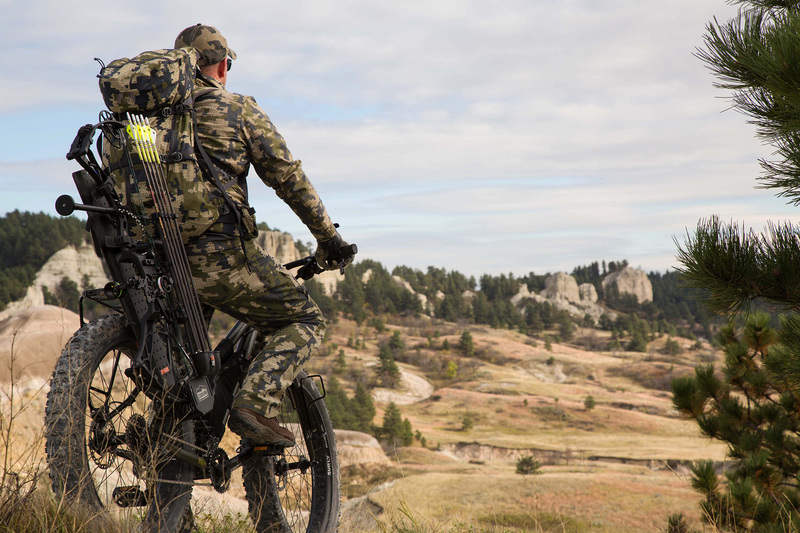 Answer: Shooting or taking game from a bicycle, whether on it or straddling it, is not specifically prohibited in California Fish and Game laws. However, section 374c of the Penal Code prohibits shooting a firearm from or upon a public road. A logging road is not a highway but it may be a public road depending on multiple factors, including who owns and/or maintains the road. But, in any case it is advisable to always be off any road before shooting even if it is not expressly prohibited by law. Loaded rifles or shotguns are prohibited in any vehicle or conveyance “while standing on … any way open to the public” (Fish and Game Code, section 2006). In your case the bicycle is a conveyance and the logging road is a way open to the public — assuming it is open to travel by everyone and not just to those having specific permission from the owner. Bicycles may NOT be used in designated Wilderness Areas. California Department of Fish and Wildlife (CDFW) law does not prohibit carrying a holstered six shot, even in a motor vehicle. The loaded-gun law applies only to rifles and shotguns (Fish and Game Code, section 2006). There are other law enforcement agencies that do have strict laws against carrying loaded guns in vehicles though. Answer: Local beach curfews are often imposed for public safety and they take precedence over state ocean fishing open hours. While there are no time limitations when fishing for finfish, you must abide by the beach curfew. Sorry! Answer: The officer was correct. It is illegal to pick up roadkill wildlife in California. No one may possess wildlife in any form unless the animal was legally taken by a licensed hunter during the hunting season for that species and while using approved harvest methods. Given this, even if the first criteria were true (your friend was a licensed hunter), motor vehicles are not a legal method of take. The next time your friend sees an animal killed on the roadway, he should not attempt to retrieve it for any purpose. Can you lure a lobster out of a hole with a sardine? Answer: Sure, you can give it a try, but I don’t know how successful you’ll be. The law says that skin and scuba divers may take crustaceans by the use of the hands only and may not possess any hooked device while diving or attempting to dive for them (CCR Title 14, section 29.80). There is no prohibition against waving snacks in front of them. Please do not reply to this e-mail. CDFWNews@wildlife.ca.gov is for outgoing messages only and is not checked for incoming mail. For questions about this News Release, contact the individual(s) listed above. Thank you. Subscribe to CDFW News via e-mail or RSS feed. Go to http://www.dfg.ca.gov/news. Like CDFW on Facebook at “http://www.facebook.com/CaliforniaDFW&#8221; http://www.facebook.com/CaliforniaDFW and Twitter @CaliforniaDFW. This entry was posted in Food/Health, Lobsters, Methods Of Take, Methods Of Take, Regulations, Roadways, Small game, Uncategorized, Wildlife Encounters and tagged crustaceans, lobsters, ocean fishing, regulations, small mammal hunting, upland game hunting. Bookmark the permalink.